​Investment Opportunities, our highly knowledgeable professionals, who portray incomparable industry skills, blend a variety of factors together in order to determine the best investment opportunity for each financier. It is this intensive examination of profitable prospects that enables our staff to form their recommendations on which properties make good portfolio additions. Through a committed focus on existing market trends and economic swings as well as an industry-specific background that enables our staff to identify potentially lucrative investment opportunities, we succeed in providing our clientele with reliable insights into potentially rewarding purchases. Each staff member at RG Realty portrays an unparalleled level of expertise, years of dedicated experience within the real estate industry, and a dedicated commitment to provide exceptional customer service replete with specialized attention, professional behavior, and outstanding guidance. Building private or institutional capital is dependent upon a wide variety of factors including market trends, the future outlook of the economy, and the resources each investor or group of investors has at hand to devote to the building of a solid real estate investment portfolio. 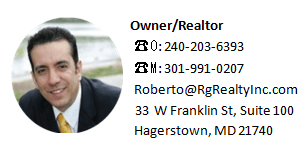 Here at RG Realty, we deliver on our promises to provide insightful guidance at every level of real estate investment, feel free to contact Roberto Gonzalez with any questions, Remember, buying Real Estate in Hagerstown is one of the best ways to build wealth!